Skype has been talking about, and demoing, its new real-time translation software for Skype for a while now, but users will begin getting first-hand experience with the tool as of today. The Skype Translator preview program begins welcoming its first participants into the fold, based on sign-ups to the Translator preview page we told you about in early November. 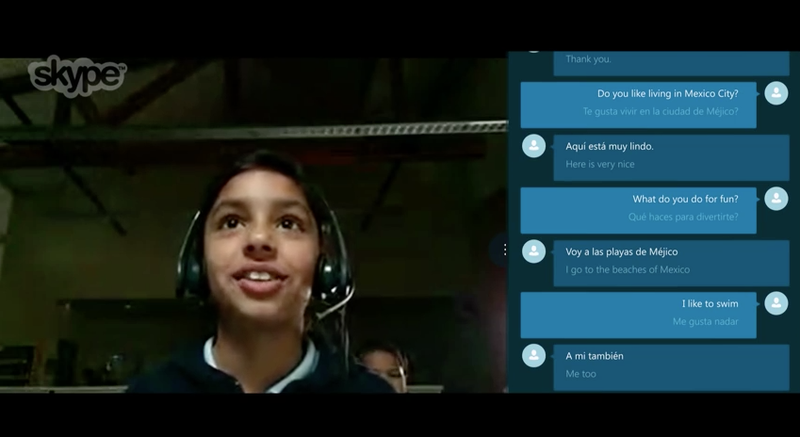 The Skype Translator project offers on-the-fly translation of both spoken and written languages for participants in Skype conversations, making it possible for two people who speak completely different languages to communicate with virtually no barriers to understanding. The preview program starts with support for English and Spanish spoken translation, as well as over 40 languages for real-time text chat. At launch, tis also limited to users of Windows 8.1 software (either desktop or mobile) so Microsoft is playing platform favorites with this early beta program. They’ve also already been testing it out with schools in the U.S. and Mexico, as you can see in the video above. The tech behind the translation involves advanced machine learning, which also means that it’ll get smarter with time and increased use; the more time it hears a word in conversation, the better it’ll become at translating it accurately. The early tests look promising, but everything we’ve seen so far has been from Skype direct and likely involved a lot of control. The classroom tests in the video above also involve mostly fairly rudimentary translation, so it’ll be very interesting to see how it performs in real-world situations with more complex language. This could be one of the most powerful technologies ever created, if it can live up to the hype, but the real test of its worth begins now.